Cadillac hit a high point in 1950, selling more than 100,000 new cars for the first time in its 48-year history and almost doubling its sales of only two years before, finally overtaking Packard. The division’s final total was 103,857 units, with the 100,000th car coming off the production line on November 16, 1950. Cadillac’s lineup included nine models in four series on four wheelbases. All were powered by the 160 bhp, 331 cubic inch OHV V-8, and the Hydra-Matic transmissions were optional. Every model was completely redesigned, from the base series 61 Coupe to the luxurious Fleetwood Seventy Five limousine. Gone were the taut fastback models, replaced by pillarless hardtops and heavy sedans with bulbous bodies, enormous chrome egg-crate grilles, big bumpers, and sweeping rear fenders with fishtail fins. Cadillacs gained curved windshields for 1950, rear windows wrapped around to C-pillars and hood and trunk carried heavy “V” emblems. The Series 61 used the GM “B” body, on a four-inch shorter, 122-inch chassis, shared with Buick and Oldsmobile. The Series 62 used the “C” body, with 126-inch wheelbase, with a two-door coupe, a pillarless coupe, a four-door sedan and convertible. The Fleetwood Sixty Special was only offered as a four-door sedan on a 130-inch wheelbase. The Fleetwood Seventy Five, meanwhile, received its first real facelift in a decade. The new “D” body was exclusive to the model and featured an enormous 146.75-inch wheelbase, which was 10 inches longer than the outgoing chassis. The Seventy Five was only available as a Seven-Passenger Sedan and an Imperial Limousine, with glass division window. This was the most expensive Cadillac that year at $4,959. In all, 716 Seven Passenger Sedans were sold, along with 743 Imperial Limousines and just one Seven Passenger Business sedan. 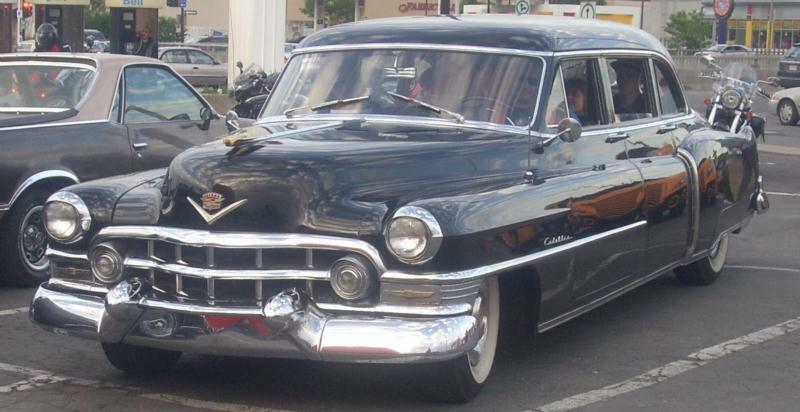 Cadillac sold 2,052 commercial chassis, which went on to become ambulances and funeral cars. The year 1950 also saw the first GM-only Motorama in New York, highlighted by the “Debutante”, a $30,000 convertible in butter yellow with an interior made from the pelts of 187 leopards. Naturally, all the interior trim was gold-plated. Three years later, GM would take its Motorama on the road. Cadillac then joined the Korean War by restarting tank production in June 1950, but also continued automobile production at full speed. In fact, 1951 production increased to 110,340, and though Packard introduced a new line, it could not keep up. Fleetwood Seventy Five sales increased to 1,090 Eight Passenger Sedans and 1,085 Imperial Limousines, while Business Sedans increased to 30 and commercial chassis production jumped 50 percent to 2,960 units. Cadillac celebrated its 50th anniversary in 1952 and delivered its 1,300,000th car. Design changes were few, though dual range Hydra-Matic transmissions were offered and power was now increased to 190 bhp through a four-barrel Rochester carburetor. Seventy Five sales remained steady with 1,400 Eight Passenger sedans delivered, 800 Imperial Limousines, but no Business Sedans. Commercial chassis sales totaled 1,694, now on a 157-inch wheelbase. The big news for 1953 was the ultra luxurious Eldorado convertible, which had been teased as a show car the year before and cost a staggering $7,750, $2,000 more than the Fleetwood Imperial Limousine. Though the body remained basically the same for the fourth year, grilles were much heavier with massive bumper guards, headlights now had an “eyebrow” design, and dished hubcaps were introduced. Sales rebounded from 90,259 units in 1952 to 109,651 and 1,435 were Fleetwood Seventy Five Sedans, while 765 were Imperial Limousines, and 2005 chassis went to ambulance and hearse builders.